Volatility is the pace at which prices move higher or lower, and how wildly they swing. These can be prices of just about anything. Volatility has been most exhaustively studied, measured, and described in the stock market. Price volatility is caused by three factors that produce wild swings in demand and supply. The first is seasonality. For example, resort hotel room prices rise in the winter, when people want to get away from the snow. They drop in the summer, when vacationers are content to travel nearby. That is an example of changes in demand. Another factor affecting price volatility is the weather. For example, agricultural prices depend on the supply. That depends on the weather being favorable to bountiful crops. A third factor is emotions. When traders worry, they aggravate the volatility of whatever they are buying. That's why the prices of commodities are so turbulent. For example, in February 2012, the United States and Europe threatened sanctions against Iran for developing weapons-grade uranium. In retaliation, Iran threatened to close the Straits of Hormuz, potentially restricting oil supply. Even though the supply of oil did not change, traders bid up the price of oil to almost $110 in March. By June, they bid down the oil price to $80 a barrel. This time, they were afraid of slowing growth in China. The emotional status of traders is one reason why gas prices are so high. The prices of some stocks are highly volatile. That unpredictability makes the stock a more risky investment. As a result, investors want a higher return for the increased uncertainty. Companies with highly volatile stocks need to grow profitably. They must show a dramatic increase in earnings and stock prices over time or pay very high dividends. Investors have developed a measurement of stock volatility called beta. It tells you how well the stock price is correlated with the Standard & Poor’s 500 Index. If it moves perfectly along with the index, the beta will be 1.0. Stocks with betas that are higher than 1.0 are more volatile than the S&P 500. Stocks with a beta less than 1.0 are not as volatile. As its name suggests, historical volatility is how much volatility a stock has had over the past 12 months. If the stock price varied widely in the past year, it is more volatile and riskier. It becomes less attractive than a less volatile stock. You might have to hold onto it for a long time before the price returns to where you can sell it for a profit. Of course, if you study the chart and can tell it's at a low point, you might get lucky and be able to sell it when it gets high again. That's called timing the market and it works great when it works. Unfortunately, with a highly volatile stock, it could also go much lower for a long time before it goes up again. You just don't know because it's unpredictable. Implied volatility describes how much volatility that options traders think the stock will have in the future. You can tell what the implied volatility of a stock is by looking at how much the futures options prices vary. If the options prices start to rise, that means implied volatility is increasing, all other things being equal. How can you use this knowledge to your advantage? Buy an option on a stock if you think it will get more volatile. If you're right, the price of the option will increase, and you can sell it for a profit. Sell an option if you think it will get less volatile. Market volatility is the velocity of price changes for any market. That includes commodities, forex, and the stock market. Increased volatility of the stock market is usually a sign that a market top or market bottom is at hand. That's because there is a lot of uncertainty. 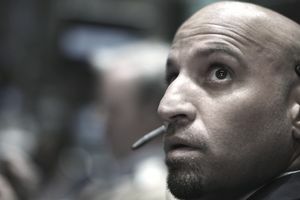 Bullish traders bid up prices on a good news day, while bearish traders and short-sellers drive prices down on bad news. The Volatility Index® or VIX® measures the implied volatility of the S&P 500. It uses stock index option prices. The Chicago Board Options Exchange created it in 1993. It gauges investor sentiment. The VIX® is also called the fear index. When the VIX® is high, stock prices fall. Often, oil prices also drop as investors worry that global growth will slow. Traders searching for a safe haven bid up gold and Treasury notes. That sends interest rates down.